Is it just me, or is Unbreakable still the superhero movie to beat? In the latest of our regular polarising-opinion series, one TF writer argues that Unbreakable remains the best superhero movie ever. Read on, then let us know what you think in the comments section below. Cast your mind back to the year 2000: Batnipples had killed Bruce Wayne’s movie career, Hollywood was ushering in an era of cheaper special effects, and while Bryan Singer was trying to resuscitate the superhero genre with X-Men, M Night Shyamalan was busy tearing it apart. Released under the guise of a psychological thriller, the director’s follow-up to The Sixth Sense, Unbreakable, turned out to be a brilliant and earnest meditation on what it means to be extraordinary. It had nothing to prove at a time when comic-book heroes were largely considered spandex-wearing jokes, but 16 years later it remains the genre’s Übermensch. 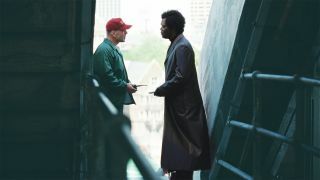 Unbreakable does two things excellently: it deconstructs comic-book culture and presents the traditional superhero story in its most distilled form, not a latex-covered crotch or bloated fight scene in sight. Avoiding many of these well-worn conventions lets the film weave in superhero mythology in more interesting ways, right up to a final showdown that trades face pummelling for hard-hitting conversation. Shyamalan understood that to make a good superhero movie fly you have to keep its characters grounded. Christopher Nolan would have the same realisation years later, but even his Batman trilogy falls into many of the traps Unbreakable studiously avoids. The relationship between Batman and the Joker gives The Dark Knight its clout, but it’s a dynamic Unbreakable explored first - “We’re on the same curve,” Samuel L Jackson’s villain Elijah Price tells hero David Dunn, “just on opposite ends” - and more acutely. Meanwhile Superman, often held up as another sacred cow of the genre, can’t take itself seriously enough to make Clark Kent interesting, while Avengers Assemble is hamstrung by overcooked action and an overstuffed cast. Unbreakable delivers a climactic battle more powerful than Whedon’s ensemble mustered, and with a fraction of the effort. There’s an unsettling truth here: superheroes too often become boring after Act One, whether that’s watching Tony Stark build his shonky first Iron Man armour or seeing Uncle Ben die for the 100th time. When the supersuits come on, we lose focus on the people beneath. Sam Raimi’s uneven Darkman understood this better, but ultimately veered into a monster movie. Unbreakable keeps its sights on what we care most about: we root for David Dunn because his journey is a struggle we believe in. He wears his powers as a sodden, heavy cloak, and even his moments of great revelation are measured; he is identifiably human from start to finish. At the same time, we have a nemesis whose motivations are formed with such a twisted logic that he’s unnervingly relatable. Also, a villain creating the hero? It’s an idea so topsy-turvy it would give the Joker a headache. Unbreakable’s only major flaw was that it was ahead of its time, unaware that Hollywood would soon catch a chronic case of superhero fever. But unlike the onslaught of Marvel and DC movies to come, Shyamalan’s true masterpiece focuses on building characters, not universes. The fact that it manages to coax a rare nuanced performance from Bruce Willis is just the cherry on top. Or is it just me? Agree? Disagree? Have your say below!